Energy efficiency measures should be a no-brainer, so why are businesses so reluctant? This week I attended an event run by the Energy Institute on whether in the context of the UK’s industrial strategy the policy can keep up with the energy market. One comment that was made repeatedly was that UK businesses are bad at exploiting opportunities for energy efficiency, and that no-one really understands why this should be the case given that cost savings should be a natural instinct for all businesses. British Gas, for example, claims that businesses could collectively save up to £4 billion, representing 20% of their overall energy costs, through efficiency measures, so the question is why aren’t they grabbing this opportunity. – Dr Peter Mallaburn, Energy Institute, University College London. Risk: energy efficiency investments represent a higher, perceived technical or financial risk than other, competing investments. For example new technologies might not fit in the existing infrastructure, or the process might have to be disrupted to make the change. Lack of information: missing unintelligible or inappropriate information can lead to energy efficiency opportunities being overlooked. Information barriers operate on the organisation as a whole and within the organisation, e.g. between energy teams and senior managers. Hidden Costs: engineering-economics-based analyses may overestimate cost-saving potential by ignoring overhead and management costs, disruptions to production, staff replacement and training, and the costs of gathering, analysing and applying information. Access to capital: even cost-effective investments will not go ahead if the organisation has insufficient internal up-front capital, or has difficulty raising additional funds. Investment could also be inhibited by internal budgeting procedures or investment appraisal rules. Principal/agent: energy efficiency opportunities are foregone if the investor cannot realise the benefits. For example, if individual departments within an organisation are not accountable for their energy use they will have no incentive to improve energy efficiency. Bounded rationality: opportunities can be ignored because individuals within organisations do not make rational economic decisions owing to pressures on their time or attention, or their ability to process complex technical information. Biases: such as status quo bias and loss-aversion affect the weight that people give to costs relative to benefits, and are different to bounded rationality, which affects the way people process information. Since these barriers were identified, Government policy has focused on their removal, with initiatives around performance labelling for electrical goods and buildings with mandatory minimum standards, energy audits, voluntary emissions reduction agreements, energy management systems and standards, technical information and advice, public procurement of efficient buildings and services, and financial support for low carbon investments. However, these measures have also failed to deliver the levels of business energy efficiency that might be expected. More recent research cited in the UCL paper suggests that this is due to the wider context for business investment, where efficiency schemes compete against other projects for management attention and capital. Energy companies, for whom energy as a topic has an obviously higher profile have been shown to invest more in energy efficiency schemes than other companies for whom energy is seen as a mundane operational feature rather than a strategic priority. According to research carried out by The Daily Telegraph, of the 760 senior managers surveyed, two-thirds were not aware of how their firm bought energy with 54% not knowing who was responsible for their energy management. 46% did not know how much their firms spent on energy, although almost a fifth of those who did know saying the spend was over £250,000 a year, indicating that the costs can be significant. 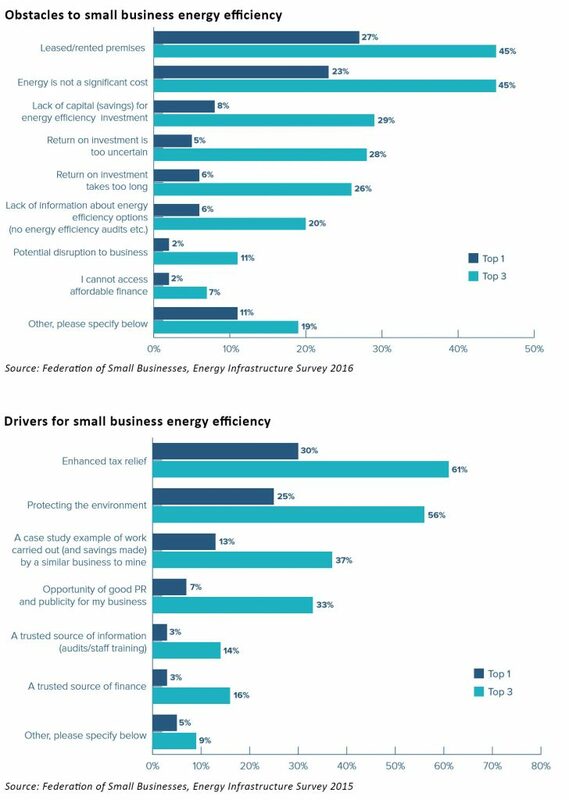 A survey by the Federation of Small Businesses found that 33% of its members believe that energy efficiency savings will offset the increasing cost of their energy, as opposed to just 23% who disagree. In terms of return on investment, 39% said they required a payback period within one year, and 55% needed to see their money back within two years. 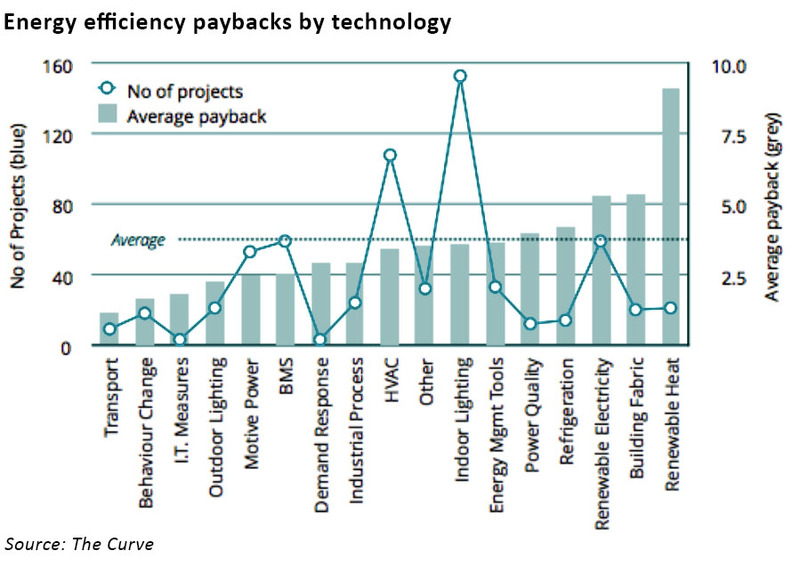 According to The Energyst, 582 UK projects have been added to a data sharing platform called The Curve indicating that typical payback periods are 3.3 years excluding generation projects, and that significant “co-benefits” are reported by companies particularly around maintenance and employee satisfaction. Companies are heavily reliant on internal cash to fund efficiency projects, with 93% being self-funded. However The Energyst also reports that energy managers are focusing on compliance and admin at the expense of new efficiency projects. Lack of data and standardisation are also preventing viable projects from attracting external financing. Some of this data can be expected to emerge from the mandatory energy audits larger companies are now required to undertake under ESOS (the Energy Savings Opportunity Scheme), however there is no requirement to act on the outcomes of the audits. As a recent requirement, it is perhaps unsurprising that the focus to date has been on compliance with the audit requirements, which can be onerous, but it may be that in future compliance periods once the audit process is more established, companies will start to look more at how the results can guide efficiency savings. It’s not just businesses that need to focus more on the benefits of energy efficiency – policy-makers also need to pay more attention. 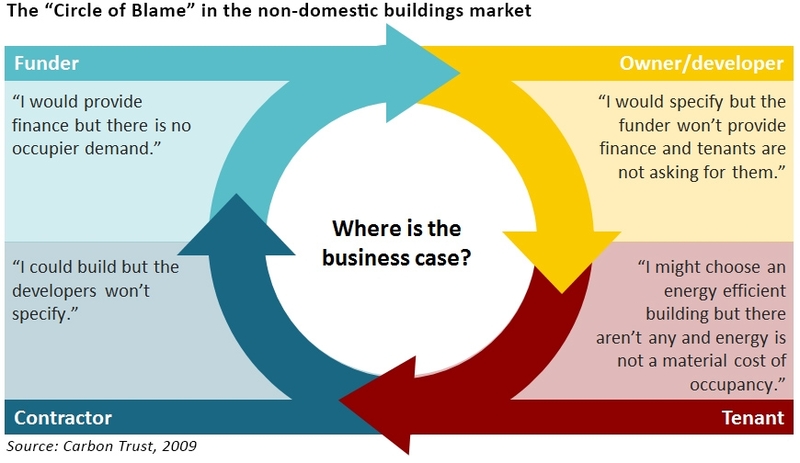 Analysis by the Regulatory Assistance Partnership on the German market indicates that every saved or avoided kilowatt hour has a long-term system value of 11-15 euro cents in avoided generation, transport, and distribution costs, yet policy-makers there as in the UK focus on supply-side solutions as a priority over demand-side alternatives. The barriers to exploitation of demand-side efficiencies in transmission and distribution planning are fairly obvious as they decrease revenues for revenues for transmission and distribution companies with traditional tariff structures. In addition, cost-of-service regulation does not incentivise investment in reduced consumption or load shifting. This means that in order to optimise the energy system overall, the regulatory framework needs to shift to a model where profits are not solely a function of the amount of energy that is produced and distributed. Transmission and distribution system operators need to be incentivised to pursue the lowest cost approaches, including alternatives to expanding infrastructure. In addition, businesses need incentives to invest in energy efficiency that go beyond the direct energy savings – currently, the benefits of avoided transmission and distribution investment are socialised across all users via the use-of-system cost recovery mechanics, rather than flowing to the instigator of the efficiency investment. In other words, businesses that choose not to invest in efficiency measures still benefit from the investments by other businesses, if these lead to lower overall system costs. Wholesale energy prices are rising, as are policy-related costs, and businesses may well be caught napping by the ramp up of capacity market costs due to hit bills from next winter. As costs rise, so will the incentives for active energy management – in addition to efficiency programmes, business can exploit DSR benefits through load shifting and providing grid stabilisation services. On-site generation capacity can offer further opportunities – in a higher-cost environment some of these initiatives may start to rise up the corporate priority list. Government can also play its part by formulating supportive policies, although with the distractions of a general election and Brexit, businesses may have to go it alone for the time being. Ah. Well a totalitarian state and nationalising all industry is the obvious way to achieve that. We just need a Glorious Leader. Alternatively government could simply get out of the way and let market forces take their course. Ultimately the most economically viable solutions tend to proliferate, and those that have hidden costs and so on, fall by the wayside. It’s natural localised internal capitalist system feedback. Fast to respond, and adapt to changing conditions. Which is why its always beaten massive centralised big state ideologically designed top down command and control economies. Compact fluorescent light bulb penetration in the UK versus tractor production in the Ukraine. I suspect that energy saving measures are not being adopted as fast as the ideologues would desire simply because they are not cost saving. Where they (massively) are, they are being rolled out at a huge pace: Take the revolutions in computer server rooms, Instead of hundreds of PC based servers you now have tens of Blades, each running virtualised servers as applications. Instead of Intel power hungry CISC chips, where it can be done, people are deploying low power ARM RISC technology. And its a double whammy. Not only is less electricity used per computer cycle, the requirements for cooling are massively less too. Or take LED lighting. Finally, it works, its affordable, and its very low maintenance, just like the old discharge tubes, or perhaps even better. Sadly however, putting £3000 of solar water heating panels in a roof to save £60 a year in hot water cost is not frankly worth doing. I would contest that where it makes *economic* sense, people *are* going low energy. Householders reduce electricity bills by dumping 20 year old refrigerators whose insulation is almost gone. Companies will rent space on cloud servers featuring low power technology rather than maintain in-house power hungry tin. If the numbers make sense. Forcing peole to adopt technology that costs more, is ruination. Cf ‘Renewable energy’. The problem with allowing market forces free rein in the energy sector is that someone needs to be responsible for security of supply, so a certain degree of state intervention is required to ensure this. The state has also decided that energy needs to be decarbonised through proliferation of renewable energy. This has led to a trend towards ever greater state control and a partial reversal of liberalisation as the market would not deliver this without subsidies, and the fundamental structure of the system needs to change to accommodate renewable energy. This has led to significant distortion of wholesale energy prices and dampening of normal investment signals. It’s also massively inflated end-user bills to a degree that is now politically sensitive, raising the prospect of further distortion through retail price caps. In areas where prices are not being distorted, as you say, the market is able to deliver economically viable efficiency gains. I disagree that all economically viable efficiency measure are being followed though. In the domestic sector large sections of society are unable to effect efficiency measures either due to lack of resources (inability to afford installing LED lights, or replacing aging appliances etc) or lack of control (the tenant versus landlord problem, or living in properties that are difficult to adapt). Some of these issues also apply in the commercial sector. Simple inertia also plays a part. I think regulation probably is needed to deal with the landlord-tenant issue, particularly in areas where rental contracts are typically of short duration. Landlords would only be incentivised to invest in energy efficiency if they could recover the cost through increased rents. Tenants will only be willing to pay increased rents if they can realise offsetting savings in energy bills, however lower upfront costs can be very tempting, and landlords whose efficiency investments have already paid off would be able to undercut those making new investments, meaning the prospect for landlords isn’t very appealing. Or we could elect a Glorious Leader – maybe those extra holidays would solve all our problems!